Posh futsal star Tiago Nassunculo. Peterborough United futsal stars Brandon Powell and Tiago Nassuncolo have been invited back to England Under 23 training camps. The second year scholars at the ABAX Stadium impressed at recent trials and Nassuncolo has also caught the eye of Posh youth team manager Jack Collison and will now start training with the Posh Under 18s. England invite for Posh futsal player Brandon Powell. It’s been a great few weks for the Posh futsal programme as the club’s B and C teams have been crowd league champions. Lewis Taylor scored the goals that clinched the title for both teams. The B team went into their final game against Birmingham in third place and requiring top two Norwich and Cambridge to draw their fixture to have a chance of overtaking them both. 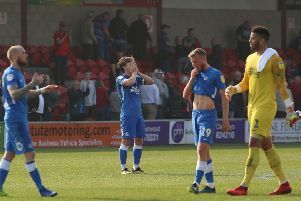 They obliged by fighting out a 1-1 draw leaving Posh needing a win to finish top. Birmingham looked set to spoil the potential party when leading 2-1 with five minutes to go, but goals from Keith Mureza and Taylor, meant Alex Findley’s earlier goal was also crucial. Posh futsal player Callum Gale. The C team started their final round of fixtures in top spot, knowing that three wins from three matches would guarantee they stayed there. And they beat Brighton 6-1, second-placed Southampton 2-1 thanks to Taylor’s late goal, and Cheltenham 3-1. Posh futsal goalkeeper Louis Bland. Posh are currently recruiting for new scholars to join the club in September 2017. The next taster dates are Saturday, January 28 and Saturday, February 25. If you wish to represent Posh and are looking to gain a BTEC level 3 in sport (extended diploma) and/or A levels than apply to https://www.ucasprogress.com/course/1901798/futsal-level-3-btec-extended-diploma-in-sport or contact Michael.johnson@theposh.com/Futsal@theposh.com. Posh also recently held their first futsal goalkeeping session under the tuition of England international Jose Lima. The sessions are free and to register interest and to find out more information e-mail Futsal@theposh.com.